Gemstone Publishing’s line of Disney comics has come to an end. Someone else will doubtlessly pick up the license, but when they do, can they escape the same mistakes Gemstone made? This week, I talk about how to make Disney Comics that work. The field was Linda’s element. Benny may get the good grades, Jamie may have been the popular one, but if you gave her a ball or a bat, Linda would always be able to dazzle her siblings away. Just five minutes after she and Gail had joined the game she pulled Kevin’s team into a 3-3 tie with Gene. They’d be in the lead by now if Tony Zeringue weren’t such a good goalie. Gene had the ball, twisting between Kevin’s players like they were in slow motion. The only one who could keep up with him was Linda – and she did. The ball traded places from his possession to hers, then back to his again. It was becoming a two-player game, with everyone else standing around watching, barely even moving because it was impossible to tell where the ball would go next. Most of the players stared at her in amazement – perplexed, no doubt, that such a small girl was creaming them. The only one who didn’t have a stunned look in his eyes was Gene, who actually seemed to be enjoying the contest. “Nice to have some competition,” he said, swiping the ball back again. Gail spun around with his maneuver, turning around in a full 360-degree circle, her eyes glazing over the empty bleachers just long enough for them to register in her brain, resulting in sheer terror. “Benny!” she screamed. Gene took advantage of her distraction, swiping the ball again and firing a shot past the goalie. His team pulled ahead 4-3, but the game was effectively over at that point, because when Gail saw what Linda was screaming at, she started screaming too. “What? What is it?” Kevin shouted. Surprisingly, his mood had only gotten worse with each of Linda’s goals. Now that they were behind again, he was even grumpier. The two teams suddenly began twittering and Linda abandoned the field. She ducked through the dugout, shouting “Benny!” the whole while. The other kids, one at a time, followed her out. “He’s over there!” Gail yelled, pointing across the canal to the edge of Kane Forest. Benny was standing beneath the shadow of the first row of trees, gazing into the woods. The man in the black coat was with him, stepping into the dark, one hand extended, one slender finger curling itself, beckoning the little boy forward. Linda didn’t waste time screaming again. This time she ran, and the others ran with her. Benny was overjoyed by this man before him, urging him into the deep trees of the forest. He had never seen him before that morning, and he remembered, in some lonesome corner of his mind, how he had once found the long, dark coat and razor-sharp fingernails frightening. No more. Now he felt like he was standing with a great explorer; someone who could take him places that previously existed only in his imagination. He was a giant, taller even than Daddy, but his face was so friendly. Had he really thought, at first, that his new friend wore a sneer? That he could have had poison in his eyes? What a silly thought. “How do you know my name?” Benny remembered asking. “My sister…” Benny said, only partially aware that Linda was nearby. That sounded reasonable, Benny decided. This man was so strange, but so nice. So comforting. He had never seen him before, he knew, but he felt like he remembered him somehow. Remembered those incredible, glowing black eyes. “He’s not listening!” Gail huffed. Linda and Gene were well ahead of the pack. By the time she was staggering across the closest, narrow bridge across the canal, the others were just rounding the carousel or ducking beneath the swings. Linda had never run so fast before. It was like Benny had lost his mind. The man in the black coat had his hand stretched out like he was pulling Benny with some invisible cord, slowly dragging him into the dark shades of the forest. When she shouted again for Benny to stop, to not go in, to come to his senses, the man in the black coat took notice. He looked at Linda – through Linda, it felt like – and wrapped an arm around Benny. He whispered something to the boy and pulled him into the darkness. Linda did not hesitate. She rushed down the path to the spot in the woods where her brother and the man in the black coat disappeared, then dove straight into the darkness after them. “C’mon!” Gene shouted over his shoulder. He charged in after Linda, leaving the other kids behind them, grouping together right at the edge of the forest. “Can’t you both stop being stupid?” Kevin said. He grabbed Gail by the arm and pulled. “Come on!” he shouted. She was so surprised by his touch that she didn’t even try to argue. They bolted into the darkness before Linda and Gene were so far ahead that they couldn’t see where they were running, and they were the last two to go in. It was very dark in Kane Forest, Linda realized, but not quite as dark as she’d been led to believe. Her eyes adjusted slowly to the conditions around her and she saw the black coat fluttering through the dark gray woods in front of her. She realized soon that he was not slowing down, not turning. He was charging in a straight line, and the light that came in from the edge of the woods was getting farther and farther away. As she ran, she reached up behind her, pulled the red scrunchie out of her hair, and threw it to the ground next to a tree. “What are you doing?” Gene huffed behind her. Kevin stuffed his hand into his pocket to pull out a note Gail passed him in school that day, but when he got his hand caught he lost his concentration. His foot caught on a root and he tumbled forward into the dirt. “Kevin!” Gail shouted. She dropped back and helped him to his feet, throwing her purple hairband off as they went. “Are we still going in the right direction?” Kevin wheezed. “I think so,” Gail said, but in truth, she wasn’t sure. The man in the black coat and Linda were both way ahead of them, far outside of their field of vision. Gene had on a pair of blue shorts and a gray tee shirt. Next to his dark brown skin and black hair, he was almost impossible to see in the middle of this forest. Benny had never experienced anything like this. Baliwick scooped him up like he were a cat and was carrying him through the woods at top speed. When his family went to Six Flags a few years ago, Dad wouldn’t let him go on the good roller coasters – he said he was too little. This was much better than any thrill ride, he knew. Branches zipped past his head at amazing speeds. Leaves hummed through the air like confetti. Wind battered his face, his hair danced like he was staring into a fan. He should have been terrified – of being with this strange man, of being whisked off to some unknown location, even of falling during this amazing race – but he was not. “Are you having fun yet, Benny?” Baliwick asked him. When she heard her little brother scream, Linda’s legs were beginning to wear down on her. She wasn’t used to this. She was an athlete, yes, but she was a sprinter. This was like running a marathon to save your life. She had already been using up energy on the soccer game. She lost track of how long they had been running through the trees, lost track of how far they’d gone and how far behind her the fading daylight was. Her mind was split right down the middle on two tracks – mortal fear for her brother and a screaming in her legs that made her afraid she would not be able to run much farther. Then she heard Benny scream. She ripped the baseball cap from her head, tossed it aside, and ran faster. Linda’s flying cap almost hit Gene in the face. He managed to bat it aside without missing a step. He couldn’t afford to miss a step. He’d never seen anyone running as fast as Linda was after that weirdo that had her brother. Of course, he’d never seen anyone running after some weirdo that was kidnapping her brother before, either. All things considered, her surprise velocity was probably a good thing. Still, it was impossible not to be impressed. He was going as fast as he could and he was only barely keeping up with her. It was remarkable, what a little incentive could do for a person. “Root!” he shouted to Kevin and Gail, hurtling the offending limb reflexively. He was working up quite a sweat in this mad rush. If Linda weren’t in such a mad panic, this would almost be fun. He imagined himself as a superhero, charging through the woods at the speed of light. Even better – leaping through the air, pouncing from tree to tree, dressed in a costume like some giant animal, landing in front of the villain just before he could make a getaway, saving little Benny from the clutches of evil. He’d read enough comics to know how it would work. A few well-placed kicks, a blow to the nose and his enemy would crumple like a tissue. It always looked so easy. Superheroes in the comics, typically, did not have to do quite this much running. Then, as suddenly as it had begun, the wind stopped. Benny felt a short jolt as he and Baliwick came to a halt and the whole world came into focus around him. Baliwick was smiling. It was the pond. The pond in the middle of Kane Forest he had been warned about his whole life. He’d often been kept awake with nightmares about the beasts that were drifting through the murky, stagnant water – giant blue fish with foot-long teeth or ugly, scale-covered swamp men that slept at the soft bottom of the water until they heard unsuspecting children splashing around above them. But this wasn’t the sort of murky slime he expected at all. This water was smooth, silver, perfect – like looking down into a giant mirror. He gazed down into the pond and saw himself looking back up in astonishment, smiling, his eyes glimmering with just the slightest hint of orange behind the usual green. Well that was odd. “Why?” Benny said, but when Baliwick grabbed him again he inhaled heavily and didn’t let it go, even when Baliwick leapt into the air, still holding him, and crashed forward into the freezing water. There was some sound ahead of Linda – it sounded almost like a splash – and she tried to press forward harder, but she was already going as fast as she could possibly manage. Even here, at the point of her exertion, she could feel Gene nipping at her heels. She’d lost track of how long she had been running, and her watch was long gone, discarded next to some bush somewhere, but it was long enough for her eyes to grow quite accustomed to looking through the darkness. She kept the man in the black coat in her field of vision until all of a sudden he was surrounded by a halo of light that hurt her eyes. The splash came only seconds later, and there was a flood of light in her face, almost blinding her. “Benny!” she shrieked, unable to look anymore. Gene began to push her forward, using her body to block the light from ruining his own vision, and they both could see a bit clearer when their feet pounded into the sand. “Linda, hold it!” Gene yelled, holding her back before she flipped forward into the water. They both beat their eyes, trying to adjust to the light. “Where are they?” Linda said. They got slammed by Gail, still moving at a full clip and apparently unaware that her friends had stopped moving. Gene stuck his feet out in front of them, digging into the sand and holding them in place. There were only a couple of feet between them and the edge of the water to begin with. Two more inches and they would have fallen in. “Where are they?” Gail said. Just as Gail was getting her bearings, Kevin hit the entire pack. Gene was caught off-guard and his feet skid, hitting the surface of the pond and sliding like it was ice. There was a chorus of screams and a chorus of splashing, and all four of them fell into the pool in one big, tangled mess. It was cold, Linda thought. For a long moment, it was the only thing she thought. Slowly, other ideas entered her head. She could not see. She could not breathe. She didn’t even know which way was up. It was like she and the others were falling through the water, if such a thing were possible. She flipped several times, her head and feet spinning around over and over each other, her lungs beginning to ache. How long had it been since she took a breath? She was gasping when she fell in; she had not inhaled deeply. Could she possibly stand this much longer? She was a good swimmer, she always had been, but she wasn’t sure which direction to swim. She couldn’t believe how deep this pond was, especially so close to the shoreline. The direction that “felt” like down could have been up or sideways or anything. Or she and her friends, still in a bundle next to her, could have been getting farther and farther from the oxygen they needed. How long could the others hold their breath? Not long, she bet. Maybe Gene could outlast her, but she doubted Gail or Kevin could. Just when she thought she would last no longer, her mouth cracking open underwater to unleash a frustrated scream, her hand broke open into precious air. It was “down” after all, if she had tried to swim in the direction she thought was up she just would have made things worse. She spun around and thrust her head up through the surface of the water, taking in air in deep, desperate gulps. Around her she could hear the others do the same, although she couldn’t see anything yet, there was still too much water in her eyes. Trying to wipe them clean, she beat her feet, trying to swim in the direction she thought the shore was. As the water drained out of her face, allowing her to crack her eyes open, she realized they had spun out into the center of the pond. “Kevin!” she heard Gene gasping. Behind her, Gene was trying to help his friend stay above water. Gail tried pushing him as well, and Linda swam back to help. Together, the three of them managed to get Kevin to the shore, where they lay him out at the foot of a tree and collapsed in a heap next to him. “Remind me… (gasp)… never… (gasp)… to do that… (gasp)… again,” Gail managed to say. Confused, Linda forced herself to look around. They’d set ashore next to a tree all right, a tall, mighty oak, but now it was the only tree growing next to the pond. Next to this pond, anyway. In every direction she saw more ponds, more and more, stretching out into infinity, each filled with the same perfect silver water as the pond they just escaped. Next to each pond grew a single tree. Some looked familiar to her – they could have been fruit trees or palm trees or even the occasional evergreen. Some looked quite alien, made of rock or crystal. One she saw in the distance even seemed to be made of some reddish fleshy material. As if to confirm this, its branches lashed around like the tentacles of an octopus, flailing in the air. Then there was the sky. She had expected the sun to blind her the way it did when they broke through the trees, but it did not happen. There was no sun. No moon, either, and no stars. There was some sort of illumination, but there didn’t seem to be any light-source, she could just see everything. The sky above, rather than blue or purple or midnight-black, was a sort of cold gray… no, it wasn’t gray, that was just her brain trying to make sense of what she was seeing. It was nothing. No color at all. All four of them were staring at their surroundings now, even Kevin, who seemed all right once he took a few breaths. Gene had scooped up a handful of the sand they were lying on and saw that it wasn’t regular sand either. It was some sort of coarse, gray, gravel-like substance, but softer than stone and easier against their skin. Each gray bead seemed to absorb some of the water that was dripping from their bodies. Linda was about to say, “Feel what?”, but before she could, she realized what Gail was talking about. The water that was clinging to their skin, their hair and their clothes when they came out of the pool was no longer clinging. It was flowing instead, dripping down their bodies like it was being pulled down by some sort of water-magnet. They could feel the droplets sliding down so the gray sand could leech it up. In a few seconds, they would all be completely dry. “Where are we?” Gene whispered. “How do we get home?” Gail asked. “What happened to my brother?” Linda said. None of them were given an answer. The boys are back with another creator spotlight, this time on writer Kurt Busiek! From his early days on Justice League of America and Power Man and Iron Fist, through his career-making work on Marvels and Astro City, right through to his current work on the weekly maxiseries Trinity, the guys break down all of his work, talk about their favorites and least-favorites, and discuss the next project he’s going to be involved with, Wednesday Comics. In the picks this week, Blake recommends Batman: Battle For the Cowl #1, Mike dug Action Comics #875, and Chase is all about Thor #600. This week’s graphic novel pick: American Flagg Vol. 2! Write us with comments, suggestions, picks of the week, “Ask Chase Anything” questions, or anything else at Showcase@comixtreme.com! PLUS: It’s Week in Geek time again! This time out, Blake and Chase discuss Lost: He’s Our You. Chase gives his thoughts on the final episode of Battlestar Galactica and last week’s South Park, Blake talks about the episode of Dollhouse that rescued his interest in the show, and both boys dish on recent episodes of Smallville, Heroes, and Kings. Week in Geek #14: Battlestar Galactica finale, Dollhouse “game-changer,” and more! It’s been some time since I updated you guys with my recent reviews over at Comixtreme. I am still writing them, though! Not as many as I used to — we don’t do the Marvel advance reviews anymore, which reduces my workload considerably. Now I’m only reviewing the books I volunteer for. It’s still quite a bit, though. This week, for instance, I reviewed the first issue of The Muppet Show from Boom! Studios. This book is really good — the writing is sharp, funny, and perfectly mimics the TV show. Even the musical numbers are still intact. I love it. And of course, you can always shuffle through my past reviews at the terribly incomplete and constantly-being-updated Comic Reviews Archive Page right here at Evertime Realms. I am, without apology, a big fan of the work of writer Neil Gaiman. His Sandman series is nothing short of a masterpiece, and the several of his books I’ve read have always entertained me to the fullest. Having just finished his latest novel for young readers, The Graveyard Book, I can proclaim his track record unbroken. This book, which was the winner of last year’s Newbery Award for outstanding children’s literature, opens up with a murder. Several of them, in fact, as a man named Jack kills three people in the dead of night. The fourth member of the family, an infant, escapes and is spirited away to a nearby graveyard, where he is adopted by a pair of friendly ghosts. As the boy, named Nobody Owens, grows up, the book follows his adventures — both in and out of the graveyard — until the young man he has become faces an inevitable confrontation with his parents’ killer. Gaiman is at his best when he’s pulling out the really bizarre, out-there concepts, and that’s what this book gives us. Nobody (“Bod” for short) grows up raised by a pair of ghosts, living in a graveyard full of intriguing characters that are just as dead as Bod’s parents. Teachers, children who stay the same age as Bod grows up, the mother who died in childbirth that still fusses her grandson buried in the same cemetery, and the teenage witch who watches as Bod evolves past her all help make this book a fantastic piece of work. Silas, Bod’s guardian, is a particular enigma. He’s not a ghost, but nor is he alive. He, like Bod, has been given the “freedom of the graveyard.” His attempts to teach Bod and protect him often lead to different adventures than those he was attempting to avert. The book is fairly episodic in nature, telling short stories about Bod at different points of his life, beginning at his infancy and leading to his teen years. Some of the stories pay off at the end, but others are plot threads that simply end as Bod grows up, much like real life when you get right down to it. As we go through the stories, though, we see hints and pieces of a larger mythology that Gaiman has crafted for this universe. A great number of ideas are left dangling, but it seems clear that the writer intends to return to them later. This is without a doubt one of the strongest young readers’ novels I’ve come across in years. It’s fully deserving of the accolades it has received, and has me intently awaiting whatever comes next. Erin got this dynamic duo for me herself. For those of you who don’t follow comics, Black Lightning here is Batman‘s sometimes-teammate, both in the Outsiders and in the more prominent Justice League of America. Jefferson Pierce is a cool character, and a particular idol of mine because he’s a teacher. If I could tell you the number of times I’ve wished I could sent electric shocks through some of the — ahem. But I digress. 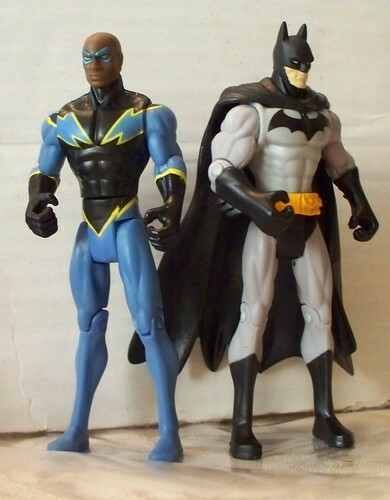 These two figures use the basic IH body, with the addition of a cape, belt, ears, and pointy glove-thingies to Batman. It looks like Black Lightning’s head sculpt is slightly different as well, which is a nice touch, as it looks much more like he would in the comics than he would with a basic head sculpt. This figure is cool, and it really makes me hope they find a way to do the Milestone heroes in this scale, if for no other reason than so I can reenact the scene where Jeff wants to know why everyone keeps asking if he’s related to Static. 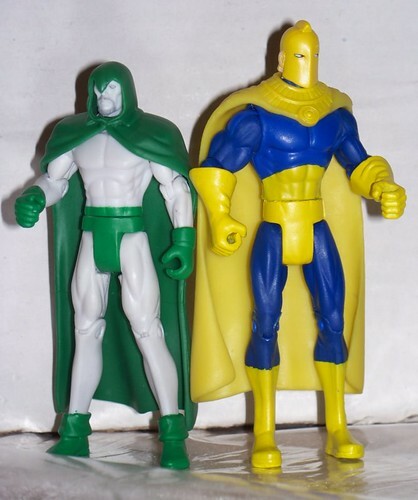 Here we have the recent incarnations of two of DC’s Golden Age heroes, the Spectre and Dr. Fate. The Spectre is the Spirit of God’s Wrath on Earth, but needs a human soul to bond with to keep from getting too out of control. The ghostly Van Dyck on the Spectre’s face tells me that this is former Gotham City Police Department Detective Crispus Allen, the Spectre’s current host, who was bonded with the spirit following his murder by a crooked cop. The rather ornate collar on Dr. Fate, whose helmet channels the power of Nabu, one of the gods of Order, tells me that this is actually the good Doctor’s second-most-recent mantle-bearer, Hector Hall. The current Dr. Fate, Kent Nelson (nephew of the original Dr. Fate) has a more streamlined look. 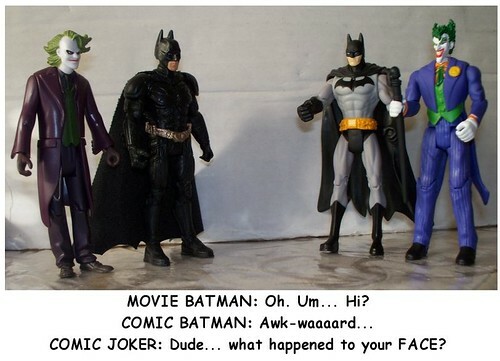 Finally, there’s the Clown Prince of Crime, the Joker. This is one of the few figures that uses virtually nothing from the “basic” body, but it looks pretty good. The vest/coat/flower combination is sculpted well, and the pants look good. I like the rather pointy chin the sculptor whipped up for him too. 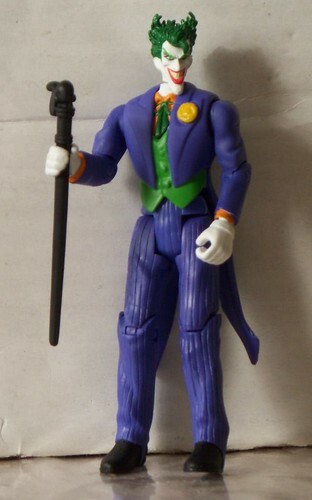 He’s also one of the few figures in this line to come with an accessory, his cane. The only thing I don’t really care for are the little “devil points” his hair curl up into. A little too on-the-nose, if you ask me. Six years and 299 columns later, I sit down to write the 30oth installment of Everything But Imaginary. This week, I look at how the comic book landscape has changed since the first column came out, comparing comics THEN to comics NOW. Plus, my pick of the week: Ender’s Game: Battle School #4!